A member of the University of Tokyo Baseball Club, Tetsuya Ijiri once served as captain of his team in college. While “living for baseball” from a young age, he always aimed for the top and strove to become better, diligently practicing every day. Today, as a researcher, he is leveraging his experience in sports towards the pursuit of methodologies to enhance sports skills from the point of view of science. —So you once served as captain of the University of Tokyo Baseball Club, right? When did you start playing baseball? Ijiri: I joined a little league baseball team in Tsukuba City where we lived when I was in 2nd grade elementary school, and that was the start of my involvement in the sports. It was quite a strong team; we qualified to play in Kanto-wide competitions, but the older kids were really good, so I was only able to play as pitcher in a competition when I was in 6th grade. After that I went on to attend the local public junior high school and public high school, and through college, baseball was almost the only sports I did. But I had an inkling that it would be difficult to make a living in baseball. When I was in junior high, I became a member of the Ibaraki Prefecture’s sponsored baseball team, where top players of the prefecture were brought together in one team. At that point I knew I was completely different, in terms of physique as well as skill. And in high school, the highest I reached was only top 16 in the prefectural competitions. But somehow I thought that I could still develop my skills while I was in college; I wanted to test my capability. So I decided to aim for the Tokyo Big6 Baseball League. Ijiri: Don’t take this the wrong way, but I think the university entrance exam is easier compared to baseball. I mean, you can’t hurt your head by studying too hard (laughs), and you can succeed in your entrance exams through practice and effort. But in baseball, there is no guarantee that you will get better by practicing, let alone that you could end your athletic career through an injury or accident. What I mean is that the entrance exam, which has exact answers for specific questions, is easier. Later on, I transferred from the College of Arts and Sciences to the Faculty of Agriculture, because there was a baseball field near the Faculty of Agriculture campus at Hongo (laughs). Ijiri: Eventually I realized that I was no match to the top players even in college. I worked really hard to become better since I was in junior high and tried different ways of practicing, but I wasn’t able to improve my performance as much as I wanted to. Not only that, soon enough in college I injured my shoulders, and after that I couldn’t throw a ball with my full strength. For a baseball player not being able to throw a proper ball is really a sad thing. At that point I felt that I have reached the limit of conventional methodologies. You have to not only build enough muscle strength and grow a bigger physique during your limited time in college, but you also have to significantly improve your skills within that period. There is little knowhow, however, on how to improve skills, so in most cases, athletes approach the problem by increasing the amount of practice. I am not denying the importance of practicing a lot, but the reality is, it’s not as easy as that. Increasing the amount of practice also brings higher risk of injury. The reality is that many of the members of the University of Tokyo Baseball Club have suffered injuries. You often hear that one needs to practice for at least 10,000 hours to become a top-notch player, but I think that’s a very simplistic view. Although some may completely improve in four years, some would remain unskillful no matter how much they train. So, my motivation for research is to use science to come up with new knowledge that will somehow be useful in finding methods to improve athletes’ skills. —What kind of environment did the University of Tokyo Baseball Club provide? Ijiri: Most of the members of the University of Tokyo Baseball Club entered the University to play baseball. As you may know, their skill level is completely different from players of other universities at the time they enter the university. Their physique is also completely different: while uniforms of players of other universities are stretched tight, those of the University of Tokyo players are quite loose (laughs). But they work really hard and practice a lot to build their strength. On top of that, they are very studious and find ways to improve their skills by devising practice methods and gathering all sorts of needed information. In the end, however, after a limited period of four years, a lot of them graduate without achieving a good record. In my time, I had a 5-80 win-loss record for four years, wherein I barely managed to earn two wins in the fall of my final year; but some would graduate without earning any win at all. That’s why winning a league tournament gives athletes indescribable joy, not to mention the big impact winning has in society. If the University of Tokyo team can sustain its ability to win, then the knowhow accumulated through that would certainly be valuable in the world of sports. Although it’s not easy to continually think of ways to increase one’s chances of winning, within a limited period of time, within one’s capabilities, this is what I hope for the team to do, and that somehow our research would be able to help in that aspect. —So, after suffering a shoulder injury, among other seeming roadblocks, you eventually chose to become a researcher. Ijiri: That’s also one of the major reasons. While I was in my master’s course, I did research on sports medicine under Professor Koji Watarai, who was a member of the faculty at the University of Tokyo at that time. 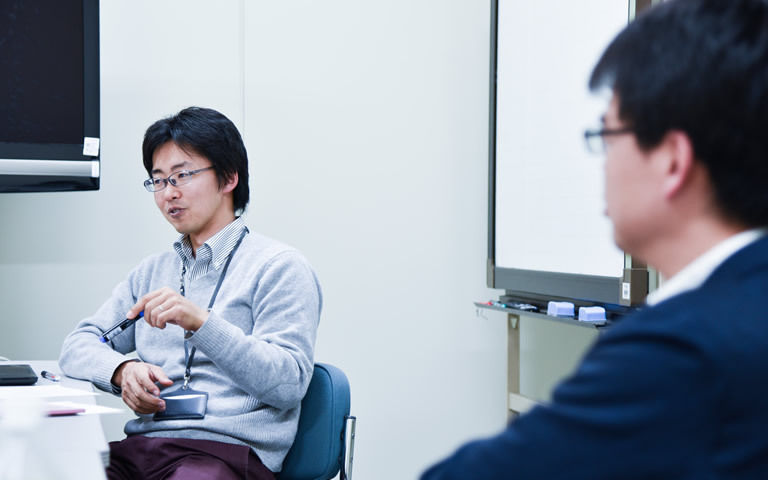 Having suffered injury myself, I started with research related to sports injuries, and then in my doctor’s course I went to join the research group of Professor Kimitaka Nakazawa, who was working on neurorehabilitation, where I started my work on sports science research. 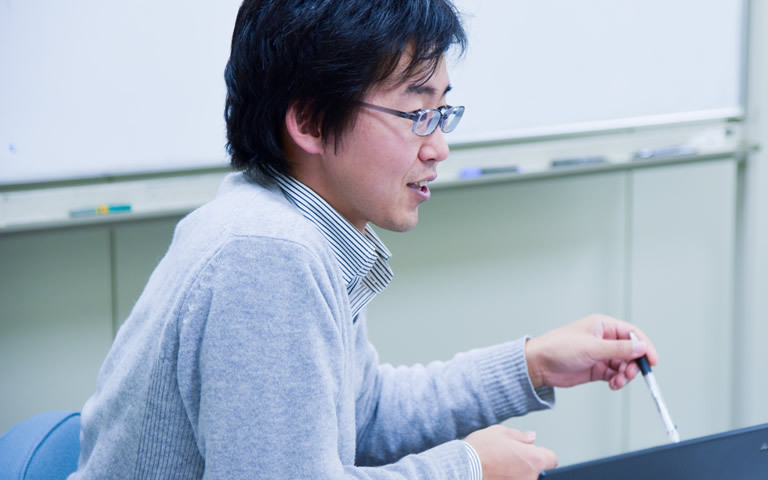 After that, I met Dr. Kashino, and in August 2014, I joined the NTT CS Lab as a post-doc researcher. —So from April 2016, you will continue doing research as an Assistant Professor at the Nakazawa Laboratory, where Masumi Kuwata-san is a research student. So, is that what led to the formation of your baseball team? Ijiri: Isn’t that amazing?! If I had not gone into research, I absolutely wouldn’t have had the chance to be in the same team with Kuwata-san. Kashino: Life is indeed full of surprises (laughs). The same for me, if I had not gone into research, I wouldn’t have met him, too. But I think Ijiri-san would have the chance to meet him outside research. Ijiri: No, I don’t think so. Kuwata-san is a top-notch player in the world of baseball, so an athlete like me who was performing poorly in the Tokyo Big6 Baseball League would not often get a chance to meet him. 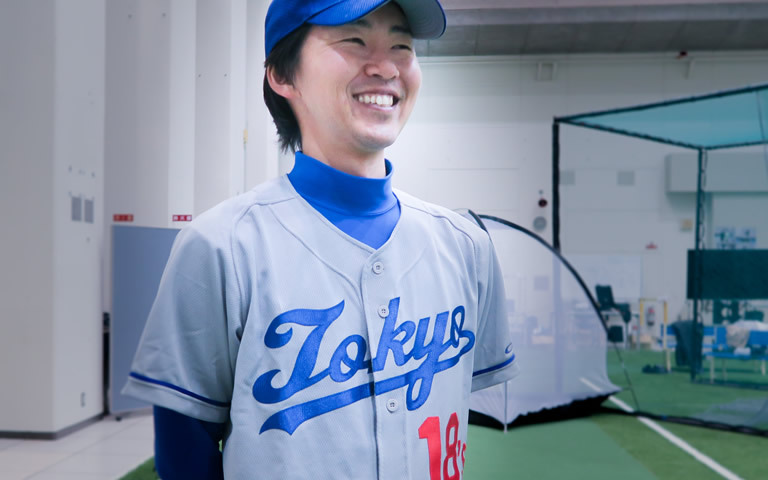 Kuwata-san came to join the Nakazawa Lab after serving as a special coach of the University of Tokyo Baseball Club, but at that time I had already graduated. I am actually a big fan of Kuwata-san since I was little, and until today, I still have my desk pad with Kuwata-san’s picture, which I had when I was in grade school, in my parents’ home (laughs). —How was the experience of actually being in a game with him? Ijiri: He is in a lot of ways a very profound person; but, in particular, the way he moves is very interesting. He doesn’t wobble at all when he moves. His movements appear so steady, like he has no part of him that flutters. Kashino: It’s like he has no roughness in him. It’s as if you are watching a beautiful, smooth-surfaced object move. Ijiri: Even when he’s just walking, he moves gracefully, and the sight of him simply picking up a stone on the ground and tossing it aside would captivate you! (laughs). There’s something in his movements that leaves us in awe, and we wonder what that is. Kashino: Probably that’s what being picture-perfect means. Spectators, opponent team members, everyone would be enchanted by his movements, which are like that of master, and ordinary people cannot imitate them. It’s part of his innate nature. —Is his body build different, too? Ijiri: He is not that tall, but his physique is completely different. I don’t know how it actually is, but his body looks thick and big as a log. It may seem an odd way of saying, but it doesn’t seem that he built his body by working out, but that it’s a natural result of labor at sea or in the mountains. I remember when I was in grade school that I tried to imitate his form in front of a mirror, but no matter how I tried I couldn’t copy his movements. Kashino: His moves are very smooth, and it seems as if there is no wasted energy. And the nerve signals are transmitted throughout the entire body in such a precise manner. The first time we played catch I was surprised at how accurately he threw the ball towards me from a distance of around one base away. But it appeared so effortlessly for him. Ijiri: The texture of the ball that he releases is also completely different. There is no trace of any interfering noise whatsoever. And his ability to adapt is extremely high, too. While professional baseball uses a hard ball, sandlot baseball uses a soft ball; and although the weight difference is only around 10 g, they are completely different to play with. Ordinary people would take time to get used to the difference, but Kuwata-san can readily shift from a hard ball to a soft ball and throw it correctly. Kashino: Even though he would say that “this is hard to throw," he would be able to adjust very quickly, which is quite amazing. I think that this is what it means to have good precision. Being able to mechanically do something in exactly the same way would be meaningless in an actual game. Rather, I think what’s important is the ability to adjust so that you can deliver the same performance in response to the changes of the condition of the mound or your daily physical conditions, for example. That’s why Kuwata-san himself said that during his playing days, he made fine adjustments to his form or the amount of force he applied to his throws when he took the mound, at every game. He must have been really adept at grasping the conditions around him and adjusting in response to those conditions. He would also take notice of how others move and would give advice at a glance, like when he took notice and complimented me that my hip movement had improved a lot. Ijiri: Someday I would also like to do research on the science behind the grace of movement. Like in the case of Ichiro, too, I’d like to look into the correlation between the grace of movement and performance. If we can determine some correlation, then it may be useful in diagnosing sports fitness or preventing injuries, for example. Going forward, I intend to leverage my own experience in baseball to continue to pursue useful research.